On Madam Secretary Season 5 Episode 20, anti-globalist terrorists attack the United Nations delegation in Geneva who are to sign the Climate Migration treaty. 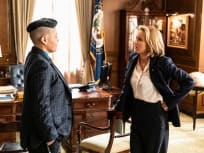 On Madam Secretary Season 5 Episode 9, Elizabeth and Jay work to keep an agreement between Serbia and Kosovo from falling apart after discovering a mass grave. On Madam Secretary Season 5 Episode 8, when Haiti's president refuses to step down after losing the election, Elizabeth tries to solve it without using military action. 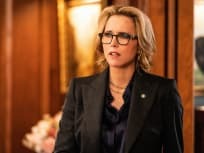 On Madam Secretary Season 5 Episode 7, Vice President Hurst asks Elizabeth for help when a surrogate carrying her grandchild is arrested for human trafficking. On Madam Secretary Season 5 Episode 6, while stranded at an airport in Iceland, Elizabeth tries to broker a deal to save the lives of Syrian refugees. 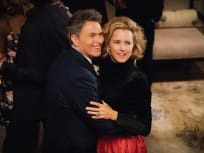 On Madam Secretary Season 5 Episode 5, Henry helps an ex-girlfriend at a religious conference in Thailand, after she is imprisoned for condemning the monarchy. On Madam Secretary Season 5 Episode 4, the remains of a WWII U.S. soldier are found in Southeast Asia but a stubborn leader blocks bringing them home. On Madam Secretary Season 5 Episode 3, after a tragedy, Elizabeth visits Fashion Week in Milan to face off with the Chinese Minister an anti-sweatshop treaty. 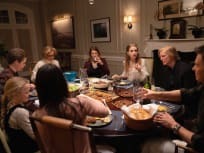 On Madam Secretary Season 5 Episode 2, Henry comes face to face with one of the attackers while Elizabeth tries to hunt down them down without starting a war. 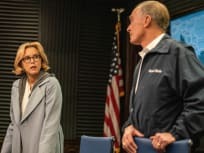 On Madam Secretary Season 5 Episode 1, Elizabeth McCord turns to the former Secretaries of State to ask their advice on how to respond to a delicate situation. I acknowledge, the United States is far from perfect. But one lesson India can take from America, despite our shortcomings, is that we have only approached our democratic ideals when we've striven to include *all* voices. Elizabeth: I'm starting to feel silently judged. Henry: I'm just unpacking, babe. Elizabeth: After 28 years, I know 'just unpacking,' and that isn't it. Permalink: After 28 years, I know 'just unpacking,' and that isn't it.